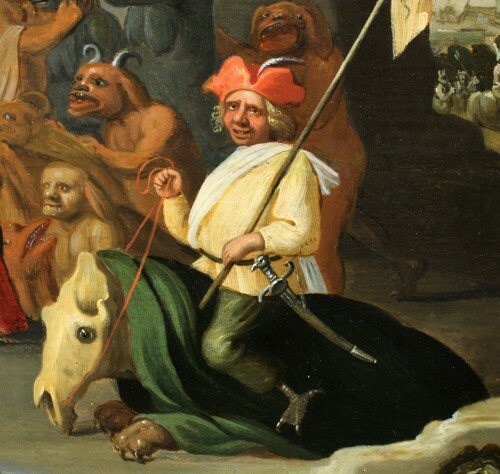 The temptation of St. Anthony is one of the subjects frequently treated by David Teniers the Younger and his collaborators. The opportunity for the painter to evoke fantastic beasts and the imaginary world, turning a religious scene into a show of buffoonery. 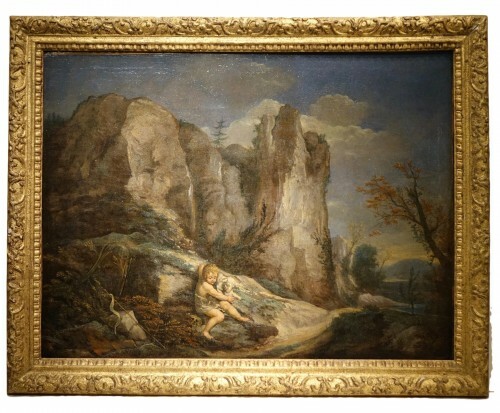 Teniers was pleased to reproduce this subject which gave free rein to his imagination. Our panel is distinguished by its palette of bright colors and bright and beautiful that allow the characters to detach from the bottom of the cave with golden hues, such a theatrical performance. In a vast cave dug in the rock, Le Saint, an old bearded man in "Antonite" dress (on his hooded dress, a pottery cross in "T" tau embroidered on the shoulder of his sleeve) is kneeling leaning with his hands clasped on a block of stone, an altar cut into the rock. He reads a prayer book placed against the crucifix leaning against a skull and an hourglass. Serene face, full of piety, the hermit is impassive to the agitation that is unfolding around him. He attaches all his thoughts to Christ and so seems to be immune to the efforts of demons to distract and tempt him. 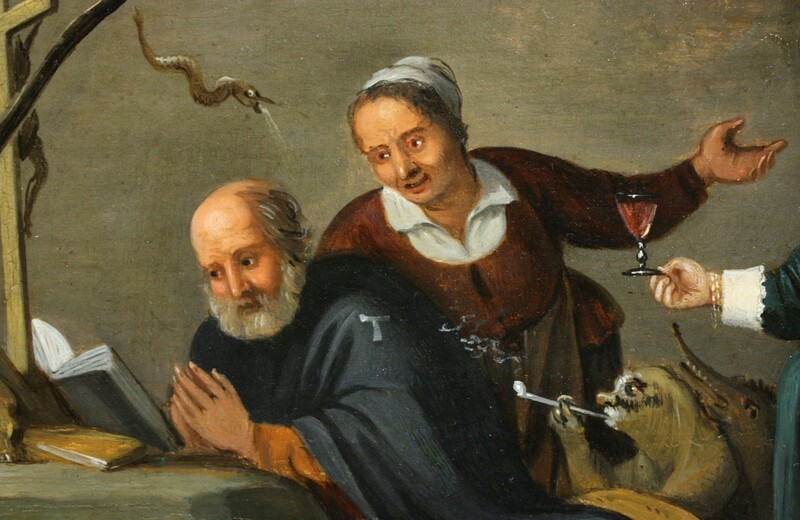 A witch or a matchmaker vainly excites the holy man to look up at a beautiful young woman beautifully dressed, who comes before him a glass filled with liquor in his hand. 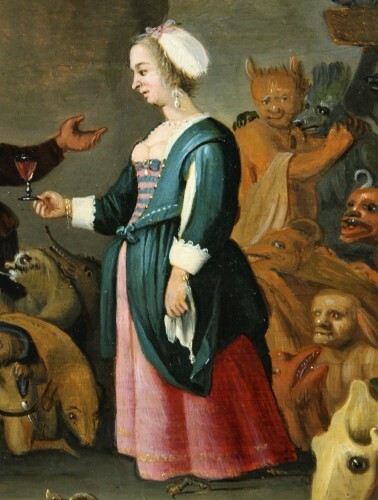 In the guise of a young woman willing to seduce him, there is a demon whose hooked legs are visible under the dress. Two fantastic beings, one pulling on his bure and the second smoking a pipe try to get his attention. Behind the demonic young woman a whole procession of evil creatures are waiting their turn to wrest the Holy from his pious meditations. Dozens of spirits from hell and dressed in more or less ugly and strange forms create a din around the hermit. His creatures are mostly grotesque, rather funny and comical representations than threatening and frightening. 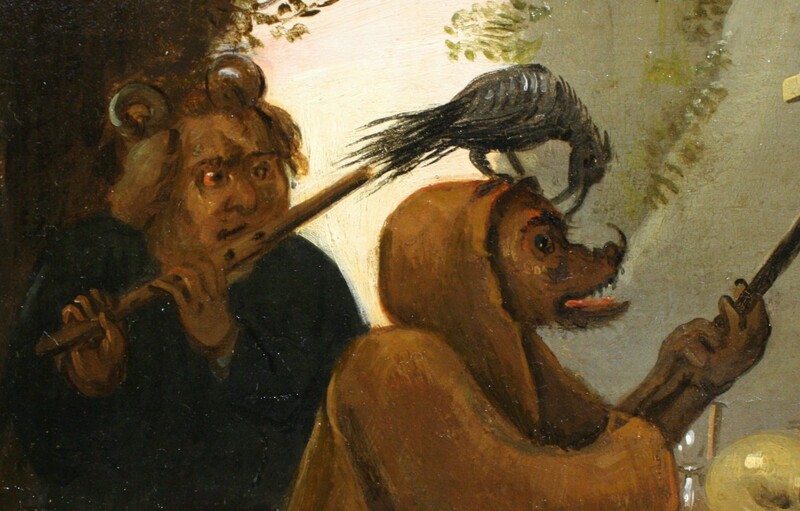 To the left of the scene in the foreground, the monster dressed in a monastic robe wears a raven on his head, such an evocation of death, behind a quirky jester plays the flute. A knight of death, servant of the devil, waving his banner with the sign of a snake sitting astride a horse skeleton covered with a large sheet. This representation that Teniers borrowed from Peter Brueghel is a symbol of hidden passions. 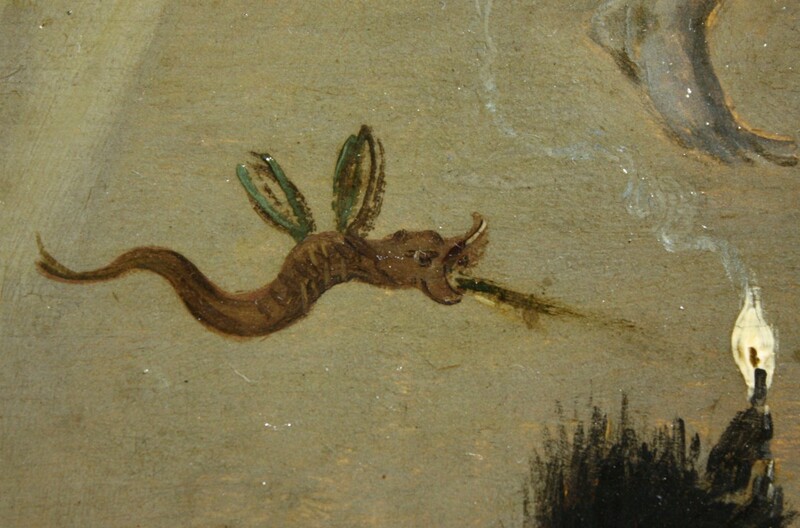 Lizards and flying serpents, a bat roar in the air, while two winged imps fight on a rock. 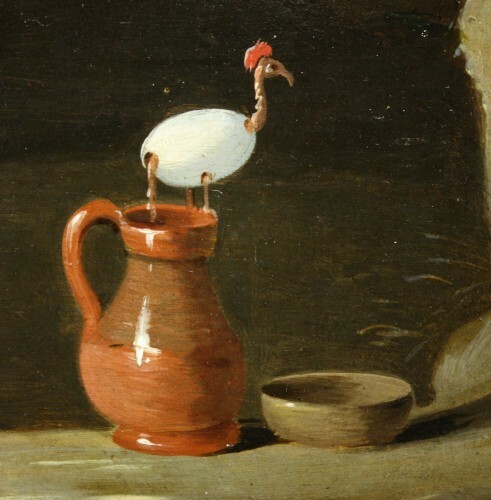 On a small pile of earth, perched on the edge of a jug an egg with the hen's head and feet coming out of its hull. This creature is defecating in the pot. The pitcher being a symbol of the ascetic life of St. Anthony, the beast takes care to make the water impure. This egg-chicken is a recurring element of David Teniers' "Temptations", his personal invention that he does not hesitate to place in each of his compositions as a monogram or a signature. Through the right entrance of the cave one sees a wild landscape and different dwellings around a church. A procession of monsters advances towards the hermit's refuge. 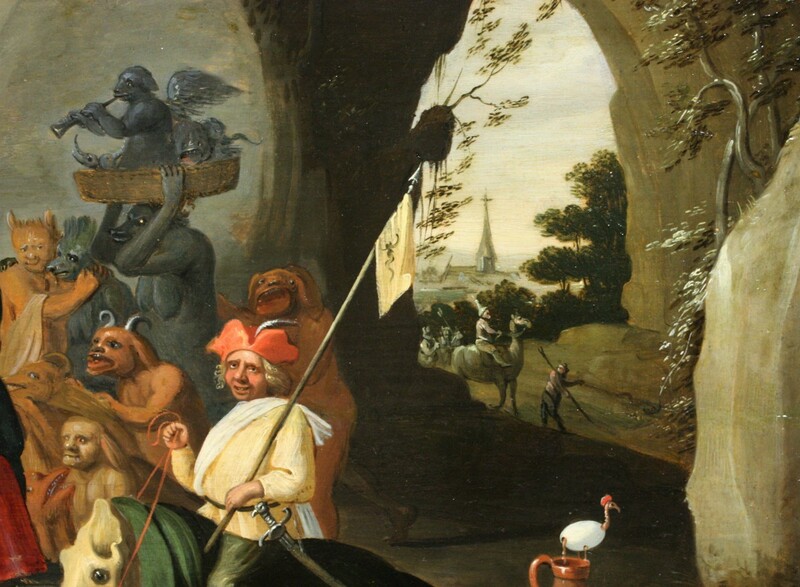 The light illuminating the cave focuses on the evil young woman, it is also placed by the painter in the very center of the composition: point of convergence or repulsion of various groups of processions of monstrous creatures. So for the artist to succumb to a woman seems to be one of the greatest temptations and a most serious sin. By making the paws appear under the skirt, the painter warns the spectator of the danger because appearances are often misleading. Our panel undoubtedly painted by one of the collaborators of David Teniers the Younger is the occasion for the artist to demonstrate his ability to handle the brush. 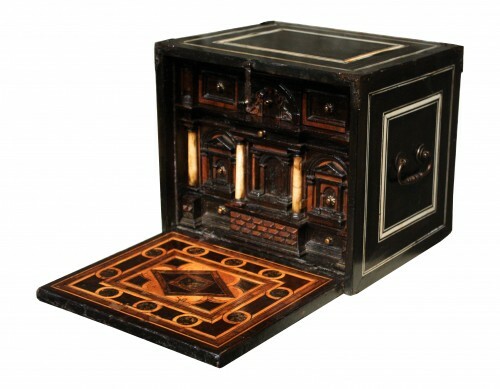 Studied lighting, elaborate composition, the details of a great precision, a touch delicate but energetic and assured make think of an independent and imaginative collaborator who while being inspired and using the elements created by the great master does not hesitate not to bring his personal touch and thus creates a unique work. 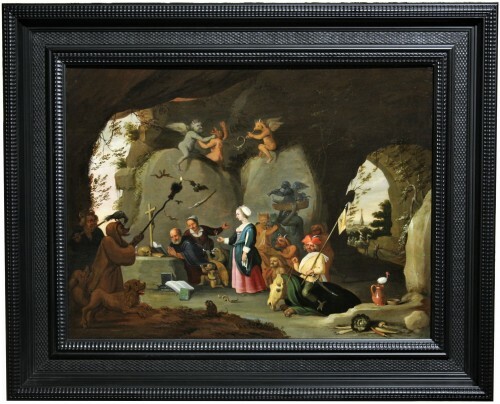 According to our research, it appears that this is a variant of Teniers' "Temptations", but not a copy of a known version. This justifies the hypothesis of an autonomous collaborator in a workshop, but also suggests the participation of the master in his creation / execution. 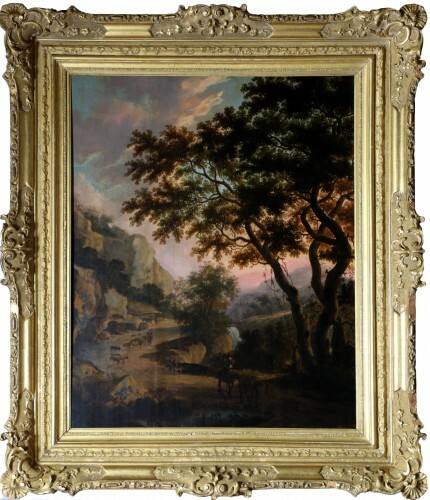 Oil on oak panel, dimensions: h. 49 cm, l. 65 cm. 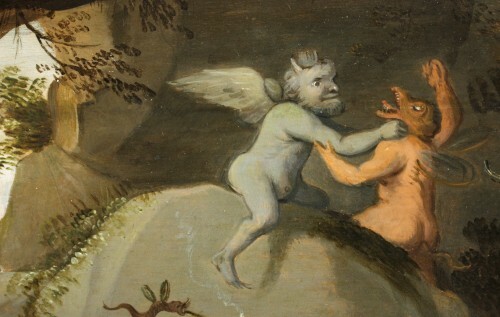 The temptation of Saint Anthony, a permanent source of inspiration in Flemish painting, is particularly present in the corpus of David Teniers the Younger and constitutes the most important group among his religious works. 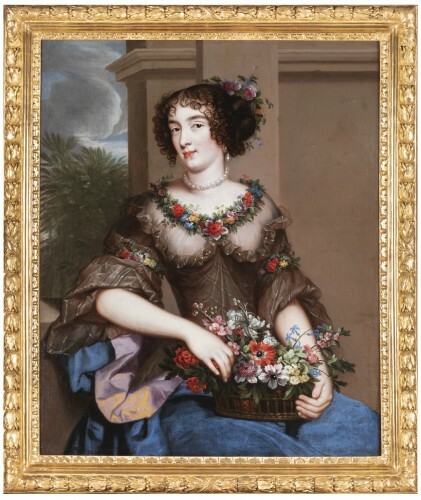 The artist has explored this theme throughout his career and over a period spanning some thirty years, the first version signed and dated 1635, the last around 1665, counting between 100 and 200 variants of the subject . 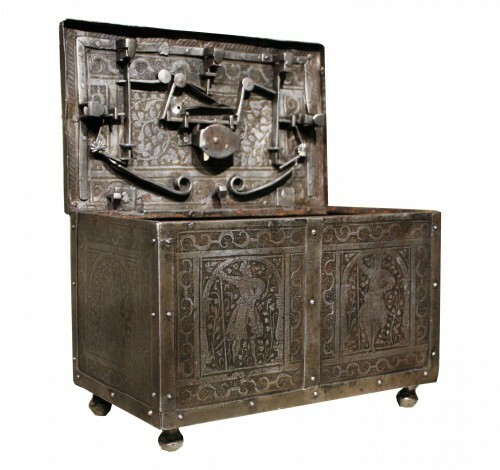 He reused and rehabilitated the same iconography and the same elements. 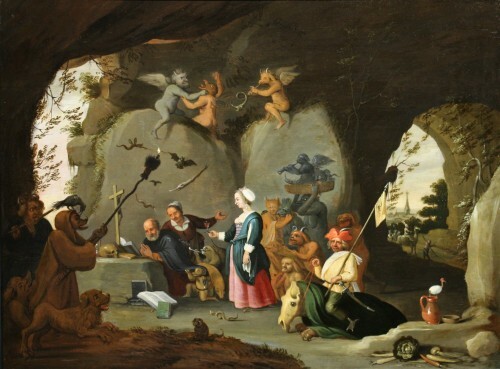 All major museums around the world have in their collections at least one "Temptation" by David Teniers the Younger: Gemaldegalerie, Dresden, Prado Museum in Madrid, Louvre in Paris, Rijksmuseum in Amsterdam, Kaiser-Friedrich Museum in Berlin, Museum of Fine Arts of Antwerp, Minneapolis Institute of Art, Hermitage in Saint Petersburg, Museum of European Arts in Tokyo, Wallraf-Richartz Museum, Cologne. 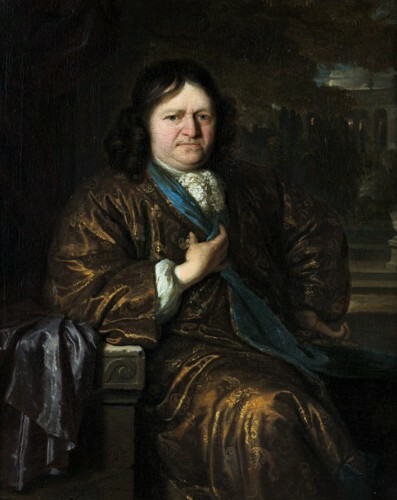 Flemish painter, son of David Teniers the Elder. 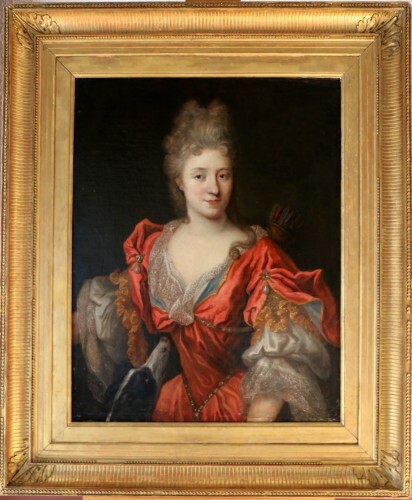 Step-son of Jan Bruegel the Elder, called Velvet, whose daughter he marries. 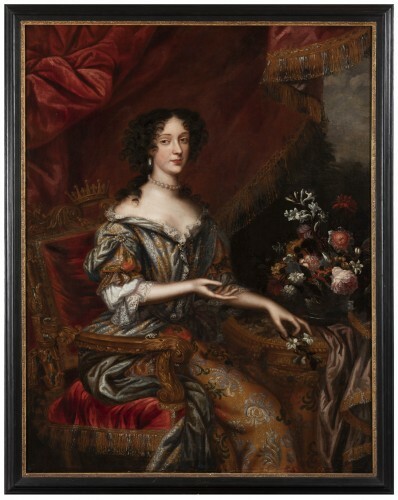 From his very beginnings, he is a very productive painter thanks, in part, to his contacts with the Antwerp art trade and his family relations. His hostel scenes, in the tradition of Flemish genre painting, quickly make him famous. He takes Adriaen Brouwer his type of characters look forbidding, caricatural, represented in the half-light of smoky interiors. It is essentially the effects of lights that interest him. Later, his eyes become less satirical and his palette clears. He then paints idyllic scenes of the Flanders countryside. Saint Anthony the Great of Egypt (251-356), considered the founder of Christian eremitism, son of rich farmers, decided at 20 years to leave everything to devote himself to prayer. He settled himself alone in a tomb on the mountainside, where he was, according to legend, subject to various temptations of the devil. It is said that he died at 105, among many disciples.